ALOHA FRIDAY PHOTO FLASHBACK.FRIDAY FOLLOW 40 & OVER! Alicia at More than Words started “Friday Photo Flashback” because she has so many pics from her PRE-digital camera days. Therefore, she came up with “Friday Photo Flashback”. I’m having so much fun doing this, that I would love for you to join us, too! So dig out the photo albums and put your scanner ON! Don’t forget to sign in to her MckLinky so we can all visit and comment on each others blogs! IT’S GREAT FUN! Please come join us. 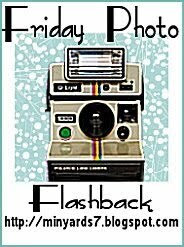 Just sign up at Alicia’s linky at Friday Photo Flashback (link above). You’ll love walking down memory lane – just as I do! This picture was probably taken in 1955 at my father’s mom’s house. My Gramma was a sweetie born in Dusseldorf, Germany. She was a great gramma that always played with me. Coloring, baking, talking and walking. Unfortunately I lost her two years after this picture was taken, but being as this is October 1st the month for Halloween I thought I’d show you a pic of myself, and my brother all dressed in our costumes. I was five (what a ham – lol), and my brother was 11. Please join in the fun and get to know your fellow bloggers at Never Growing Old!! “In Hawaii, Aloha Friday is the day that we take it easy and look forward to the weekend. So here on Fridays we’re taking it easy on posting, too. Therefore, I’m asking a simple question for you to answer & nothing that requires a lengthy response. If you’d like to participate, just post your own question on your blog and leave your link at the very friendly place of Islandlife808.com. Don’t forget to visit the other participants! It’s a great way to make new bloggy friends and find new followers! My question is: Do you play an instrument? I play the accordion, and the keys. My mon’s side of the family is Sicilian, and I think everyone of my cousins learned how to play the accordion, and naturally all the songs we learned were Italian. lol Haven’t played them in a while, but I really should. Have a Great Weekend Everyone, and THANKS for stopping by, and following me. Also, please take a look at my GIVE-AWAYS before you leave. I’m sure I’ll take a look at yours to see if there’s something I might like and visa-versa! ~hehe~ Oh! Don’t forget about this Monday – “MONDAY’S MUSIC MOVES ME” Check the theme for this week. It’s Freebie week which means MOVE ME BABY! Yes, you get to pick whatever you like. I truly hope you ALL can make it. Boogie Time! Thanks for Subscribing to emails. Hope you stop by to comment, too. My parents made me take piano lessons as a kid but hated it. Now I kick myself that I can’t play. Thanks Doll for stopping in 🙂 I love old photos! I love the costumes! So sweet! I will try and remember about monday link up!!!! Sounds fun!! I used to play the piano, I took lessons when I was 11. I lost most of it since I have not played in forever, but I remember some notes. I don’t play an instrument! People who do are very talented! Enjoy you blog and started following you today! I played piano and the clarinet growing up but probably wouldn’t be able to anymore. I do not play an instrument. I wish. I want to learn piano and guitar but don’t have the opportunity right now. I love that photo of you with your brother and grandma! Wow. Look how cute you were! It’s always great to have wonderful memories of our loved ones. WOW I knew who was in the pic when I first looked but I would of bet money on that being Missy way back when if I ever thought she had a costume like that. Funny you two were cowboy and girl. 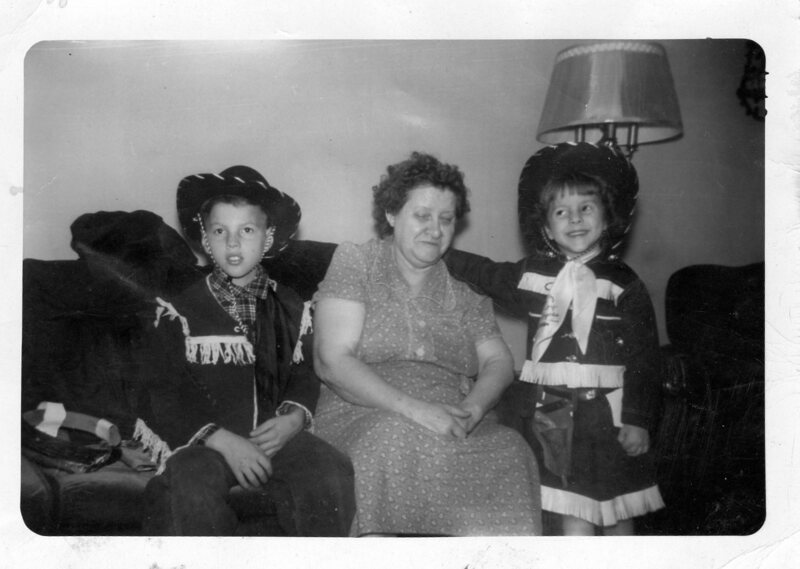 Grandma always love the Old wild west. Great costumes mom. I can’t wait until I am over 40. I always feel so left out in the over 40 follow. Hi, Xmas Dolly! Thanks for visiting my blog and helping me with the goldfish project. I will try to hook up to the Music Monday. I’ll see if I can get in the next one. If not, you’ll see me the following week. I took piano lessons for ever and I guess in the long run you could say it paid off. I teach piano lessons in my spare time. Wordless Wednesday PUR HAS TOTALLY CLEANED UP MY ACT!